The one-of-a-kind Rain area rug and tapestry is a celebration of peace and beauty and how our senses come alive when we experience the tranquility of nature. This serene scene depicts birds ascending in flight over a mountain range, as the sun shines through clouds and rain. This textural textile was handcrafted with 100% New Zealand wool in Portland, Maine. Modern and contemporary. 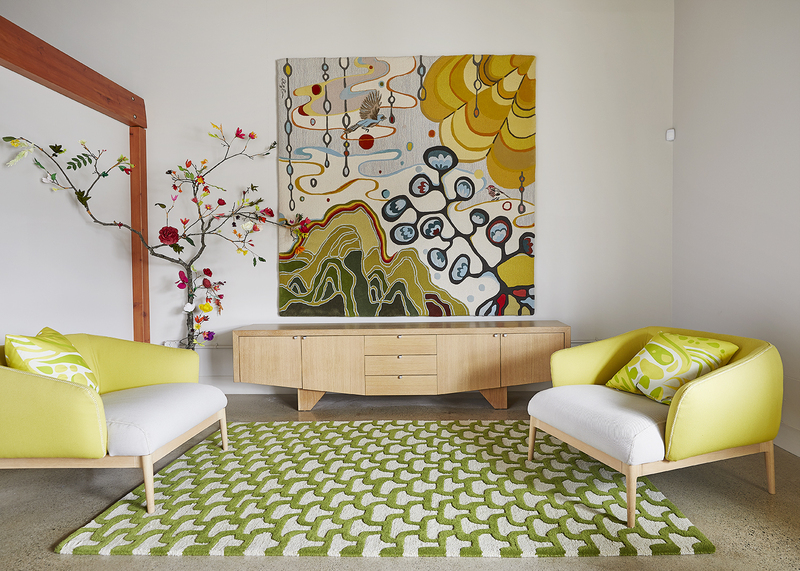 Choose an option6'11" x 6'11"
Rain is a one-of-a-kind fine art area rug and tapestry, and a celebration of peace and beauty and how our senses come alive when we experience the tranquility of nature. This serene scene depicts birds ascending in flight over a mountain range, as the sun shines through clouds and rain. Incorporates design elements of our Haze, Dalhlia, Pod and Mountain area rugs. This textural textile was handcrafted with 100% New Zealand wool in Portland, Maine. Modern and contemporary. Dimensions: W 6 ft. 11 in. x L 6 ft. 11 in.